Updated, 8:17 p.m.: Photo added. 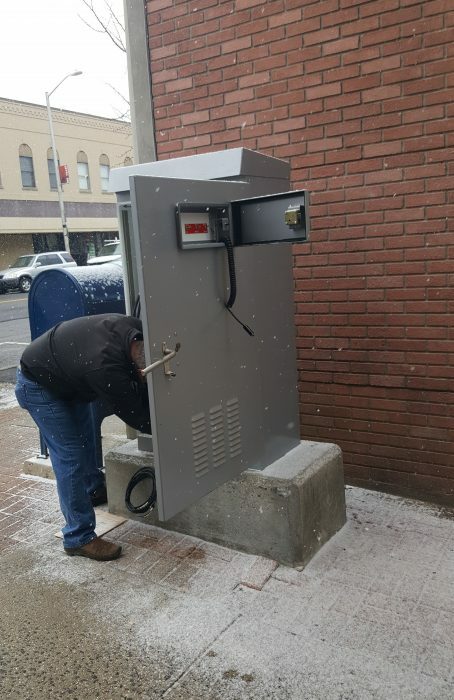 NORWALK, Conn. – A real estate broker with a history of legal battles against the City says that a utility box on his property is there illegally. City officials disagree. The latest legal contretemps between Jason Milligan and the City of Norwalk involves a signal box next to his building at 69 Wall St.
“How sloppy & disorganized is the City of Norwalk?” Milligan’s Tuesday email asked. He had written to Director of Transportation, Mobility and Parking Kathryn Hebert on March 11 to complain about the signal box at 69 Wall St., arguing that although there’s an easement on the land records, it allows pedestrian access, not a box. “I do not wish to have it remain there unless we can come up with fair / appropriate lease terms,” he wrote. Fay’s Tuesday letter to Callahan and Hebert directs them to immediately cease and desist any and all use of Milligan’s land. “Should the City choose to continue to trespass on the Owner’s Property a legal action will commence immediately,” she wrote. “Darren really should do better research and he should watch his tone,” Milligan wrote to NancyOnNorwalk. He added a vulgar personal insult directed at Callahan. Fay included a copy of the deed and offered her interpretation of the wording, claiming that it does not allow the box because it was not present on a map created when the easement was agreed. “It is not productive for me to respond to Attorney Fay’s most recent letter other than to say I am very comfortable with my position on this issue and prepared to address the matter in court if need be,” Callahan wrote. “A title search and examination of the land records for 69 Wall Street shows a long-standing easement that grants the City right of way access for the traffic signal box. It is surprising that Mr. Milligan would not be aware of this easement on his property which has been in existence since 1956. Milligan’s legal battles with Norwalk began when the Norwalk Public Library Foundation in 2017 filed a lawsuit appealing his Zoning approval to build apartments on Belden Avenue, on a parcel next to the library. The foundation is a federally certified nonprofit organization, not a city agency, and Milligan called this a “sneaky” workaround because one city agency cannot sue another. The lawsuit was settled when the City paid Milligan $460,000 for a six-year option to buy his lot, which was seen as critical to solving a longtime parking shortage for the library. Milligan says that experience inspired him to become an activist. In his telling, he swooped in and bought properties that were slated to be used as part of the stalled Wall Street Place development, often called “POKO,” because he thought that would give him a seat at the table for discussions about the area. 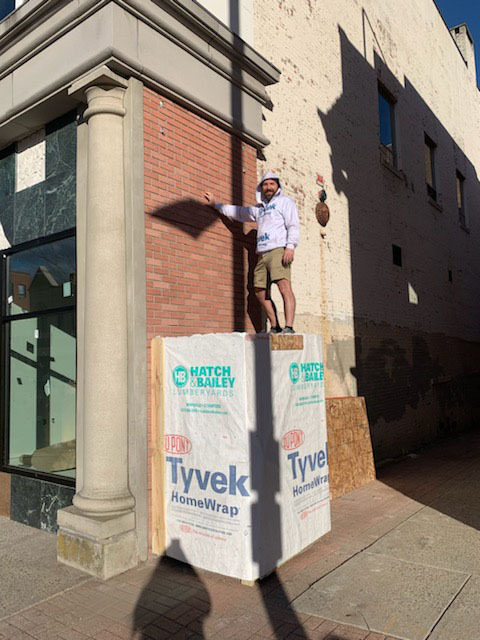 He has claimed to NancyOnNorwalk on multiple occasions that his actions are driven strictly out of concern for the Wall Street neighborhood, rather than by financial gain. Prior to the purchase, he read the Land Disposition Agreement (LDA) for the properties and interpreted the language to mean that once he bought the property City leaders would declare a default and negotiate with the parties involved, during the 30-day cure period that’s mentioned. Instead, the Norwalk Redevelopment Agency and the City declared a breach of contract, calling the default “incurable,” and sued Milligan and Richard Olson of POKO partners, alleging that their transaction violated the LDA. The plaintiffs’ request for a temporary injunction on Milligan has resulted in a lengthy hearing process. Milligan said Monday he thinks the Redevelopment Agency’s legal bills in the matter have topped $500,000. Norwalk Redevelopment Agency Executive Director Tim Sheehan did not reply to a Monday email asking what the latest total is. In court last month, he said they were more than $200,000. Stamford Superior Court Judge Charles Lee is expected on April 30 to hear evidence in Milligan’s attempt to have the case dismissed. Olson has also filed a motion to dismiss, arguing that the plaintiffs did not follow the default procedures outlined in the LDA. CCR Rivington, another defendant in the case, has filed a motion to strike the charges it faces. Coppola in court last month was asked about his conversations with Milligan, before the lawsuit was filed. NancyOnNorwalk asked Milligan if this is a stunt. If the city had the right to have the traffic box on my property it would be very easy to prove. There is a map included with the easement. No box! No mention of the box. The easement is for pedestrian access to get to the former public parking lot that was swallowed by POKO. Grant writer Morgan, have you ever been to the Wall St Neighborhood. I thought you commute directly to East Ave. Write a few grants and then hop back on I95 back to the Valley. Norwalk’s law department is very good at creating unecessary legal battles and at escalating them. Spending ever more tax payer money. Typically utility boxes such as these are located within the “amenity strip” of a street, that part from the road curb to the first several feet of the sidewalk. This is done to make it easier to maintain (from the street, like when they close a lane of traffic) and to put it out of the way of pedestrians. Remember there are the visually impaired who would find the current location of this utility box a safety hazard. This is standard procedure for thousands of municipalities throughout the world. The only places I’ve seen similar arrangements like what Norwalk has done is in the developing world. I’d like to remind the City of Norwalk that their best interests lie in the whole community, visually and not visually impaired. 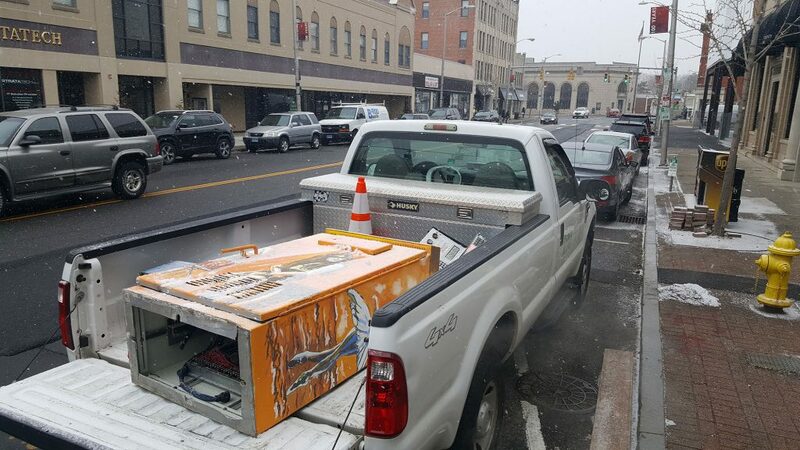 The cost to move that box will be less than following through this “my way or the highway” approach to lawsuits, however frivolous or not. Let us remember that Darren was the same dude that bum rushed the building department and tried to void a valid demo permit after only days on the job. He is the guy that contradicted Tim Sheehan’s sworn testimony about the 2004 plan being expired. Tim said it is expired and a day later Darren filed an objection claiming it is not expired. Now he is penning snarky legal letters. He provides no back up to his incorrect assertions. This is a bad case for Milligan to be bothering with. Between a prescriptive easement and the following language in the recorded easement, Fay/Milligan are wasting their time. And not looking good doing so. 3. That the grantee may erect signs, lightpoles, canopies and/or any or all other appurtences which it seems necessary or advisable to further the use of said right of way by pedestrians or to make safe or more convenient the use of said right of way by pedestrians. A traffic light and its controls are a bullseye into the heart of that paragraph. One would have assumed a thoughtful discussion would have ensued after my notice 1 month ago. An easement by prescription requires uninterrupted, open and notorious use. 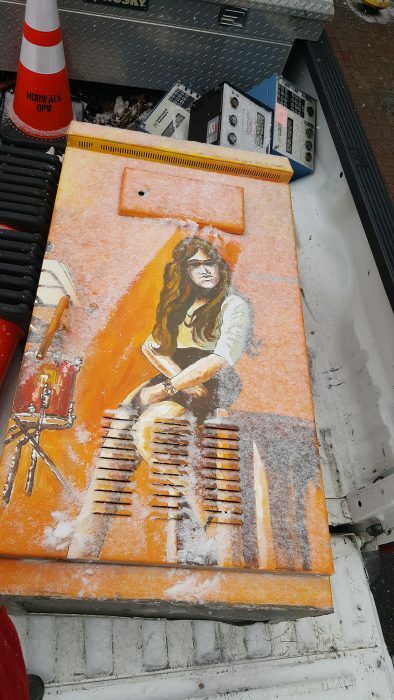 This traffic box was just replaced this year. Oops. This traffic box is the brain and mechanical componemts that runs the traffic lights on Wall st. It hardly makes pedestrian travel down a now dead end alley more safe or convenient. There is an easy way and a hard way to resolve property disputes. The city of Norwalk can teach a graduate school course on the hard way to do things. Replacement does not constitute an interruption relative to a prescriptive easement. First year law school. And a traffic light to systematize automobile movements, thus allowing safer pedestrian movements to and from the alley most certainly is a bullseye in #3 above. A contrary position/argument, in front of a judge, would without a doubt result in a verbal admonishment. But, you call it a dead end now. If I understand correctly from Google maps, you now control the City’s former parking lot on Isaac’s Street. On the map, it looks like this alley leads right from Wall Street to this lot. One would think you would be benefitting from this “dead end alley”. And really, does this control box actually effect you or your property in any way whatsoever? It hasn’t bothered/effected anyone for 40 years so what gives suddenly? Or is this just a puerile stunt because you and the City seem to have issues with each other?? We shall see. The City has not argued any of your positions. I do not own the former parking lot that abutts the end of the alley. I own a different parking lot that is open and beautiful and available to park (for a fee). I acquired the FC Bank buildings which includes 1/2 of the alley in December, and fairly immediatley asserted my rights. DPW clearly has an easement. That easement gives pedestrian access to what was a wonderful public parking lot. The easement gives DPW the right to make pedestrian access safe. They do not have the right to install or have a traffic box on my property. If they would like that right then they should ask nicely or negotiate for that right. Writing back a letter in the tone that Darren did was bad form and unproductive. It should be noted that this issue became public only after Darren wrote that nasty letter. Boooooring. Enough with this guy already.